With the economy being what it is I have felt less like spending money lately. And when I do spend I am buying fewer on-trend items and instead investing in classics that will last several seasons. It may sound challenging to reconcile “timeless” with Anthropologie but many of their pieces are updated spins on classic pieces. With a selective eye you can find many items that will stand the test of time and trends. For tops, look for long silhouettes (hitting at least at mid-hip) with minimal flair. For fall/winter, look for full-length sleeves with no flair. Shoulders with poofiness are hot right now but may not in style into next year. On bottoms, look for boot cuts in pants and A-line or straight skirts. A good rule of thumb is to look for skirts that hit at just above your knee for work-safe outfits (although if you’re daring I say go ahead and go a bit shorter!). Tall boots will hold up to trends for years — the riding boot in particular is a safe bet. Gold jewelry has come back after being considered too old for awhile and will always cycle back after going away. I browsed their site this weekend looking for some pieces worth investing in, even for the frugal fashionista. There are plenty more where these came from in-store and online. I adore this dress! Black and white simply will never go out of style. Throw a black, white, grey, purple or blue cardigan over this for an instant work outfit. At night, add a simple necklace for a great date dress. Dress it down with flat boots in grey or black; dress it up with black t-straps and a silver clutch. This dress would easily flow through any season. 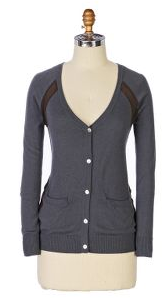 For better or for worse, boyfriend cardigans never go out of style. This season you could throw a ruffly blouse underneath to femme it up a bit for work. Match that with an updo and a nice pair of glasses and you my friend will be geek chic. 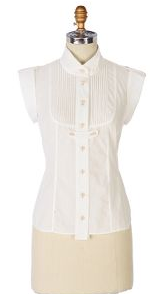 Alternately, wear a silk blouse with the top couple of buttons open and a nice gold chain for another work look. Dress it down with a striped rugby shirt and scarf for the weekend. Jeans will work great as will chinos. Finish the look off with booties. 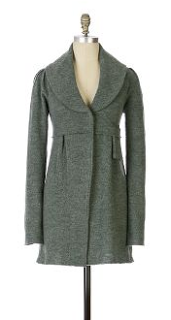 The Steam’s Rise Cardigan ($128) also fits this bill. The Inland Moor V-Neck is a softer take on the pervasive ruffle trend. While I love ruffles I realize that in a couple of years everyone will probably be all ruffled out. This sweater will endure, though, because it is understated. 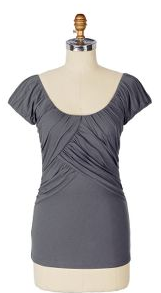 A bit of drama around the neckline is all it needs. The ruching effect also gives the sweater a bit of a preppy chic touch that appeals to the New Englander in me. A popped color oxford shirt underneath could finish off the preppy look. Wear it with a dark denim skirt and flats. Try it out with slacks and pumps for a casual work look. I suppose the neckline could fall out of favor but I think this heathered grey coat has a good chance of staying in your closet for years to come. I love the tailored high waist and the back has an attractive tailored look to it as well. Anthropologie’s site currently features this coat in two outfits (including the one at the top of this post) so I think they agree. You could really throw this on over anything — a dress, pants, a skirt/top combo, etc. I think it would do well on all but the black tie occasions. The armholes are a bit bigger than I would like, but this blouse has a streamlined and tailored look that makes it perfect for work. The tuxedo shirt shows no sign of going away anytime soon and the waitress collar would look great under a suit jacket. You could also wear the Aequo Animo Blouse with a pair of wide-leg tweed slacks and a wide belt for a modern take on a 50’s work look. I do not think I would wear this shirt in a casual look unless it was a layering piece — maybe for a family gettogether? I envy those with the shape to pull off the Labyrinthe Tee off. (Just as I envy anyone who can wear all the backless tops at Free People.) 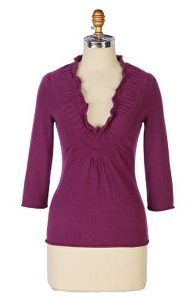 If you have the long, straight torso necessary I highly recommend this top. Anthro sells it in several colors. Yes, the layering effect at the top is quite unique but I am confident it will match well with trends for several more seasons. Under a cardigan, with jeans, with a simple a-line skirt this top will shine. Use statement jewelry to make it a work-ready top or throw on a tailored jacket over it on the weekends. Pants are — in my opinion — the hardest investment for the long term. From flares to skinny to tapered to bootcut to wide leg it’s hard to predict which leg style will be hot from one season to the next. Personally, I stick to wide legs and straight legs for work. Casually I own one pair of skinnies and the rest are bootcuts. This seems to work out well. Pinstripes are by far my favorite work look for a dressy office. They are slimming and exude confidence. Pair the Point-to-Points with any color or neutral blouse (yes, even brown) and maybe a vest if you’re feeling daring. Keep it simple with an elegant blouse and an updo. You’re on your way.